The tourism promotional event for Eastern European and Central Asian countries that was themed in accordance with the Belt and Road initiative (BRI), took place in Beijing on November 26, during which government representatives from dozens of countries and up to 30 representatives of travel agencies attended the event. Several cooperative agreements were signed between the Chinese and overseas travel agencies for promoting the outbound tourism to the countries in the region. 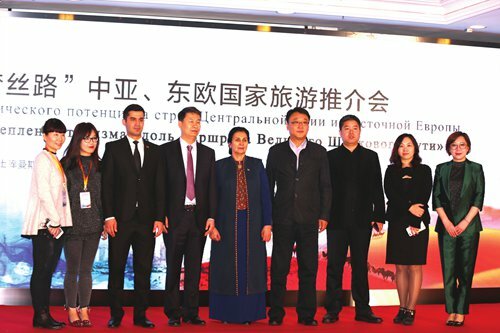 Hosted by the Turkmen Embassy in Beijing, Beijing Youth Travel Service Co., Ltd and Beijing Shuangxiong Foreign Service Company, the event is to raise awareness among the Chinese tourists of the rich travel resources that Eastern European and Central Asian countries have to offer. The Ambassador of Turkmenistan to China Chinar Rustamova attended the event and delivered remarks in which she gave a detailed introduction of the potential tourism industry in her country and extended her wishes for developing more travel routes for tourists to draw more Chinese people to Turkmenistan. "We have great tourism potential that is unknown to many foreign tourists, including the Chinese, and there is no doubt that having the opportunity to visit several central Asian countries to help Chinese tourists see the great achievements of our country, understand and love the culture and traditions of our people is a very necessary tourism exchange," Rustamova said. "That is why we invite these tourism companies to China to demonstrate the great tourism potential and make these national resources the foundation of international tourism." To promote the cooperation between Turkmenistan and Chinese tourism companies, the first visa center dubbed the BRI Visa Service Center was established in Beijing in July, providing visa consulting services to Chinese individuals and companies to Turkmenistan. The Chairman of Beijing Youth Travel Service Co., Ltd, Zhang Nan said in his speech that they have signed an annual ticket agreement with China Southern Airlines to make it cheaper for people traveling between China and Georgia. At the same time, the company also signed a training program with a local tourism agency that offers horse-riding tours to Chinese horse enthusiasts in Turkmenistan. The career development center of the Red Cross Society of China has partnered with Beijing Youth Travel Service to promote the geriatric recuperation tour project to the regional countries. The Ambassador of Georgia to China Archil Kalandia, the Ambassador of Armenia to China Sergey Manassarian, the Ambassador of Tajikistan to China Davlatzoda Parviz, and the Ambassador of Moldova to China Denis Jelimalai also attended the event.